This is a RAM expansion designed for a RAM expansion! 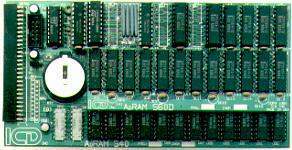 If you've expanded your A500 with an AdRAM 540, then this card fits on top of the AdRAM 540 and provides your A500 with an additional 2MB of RAM. Page contributors: Jan Dwornizky, Michael M Rye.